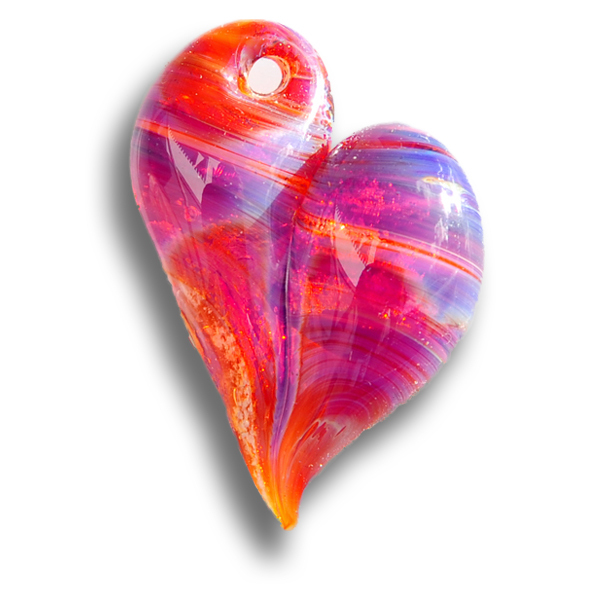 Description: This Cremation Keepsake Pendant is a stunning classic Heart design cremation pendant is made from optical clear Pyrex glass and has swirls of purples and ambers interwoven with your loved one’s cremains. A soldered Sterling Silver Jump Ring will be added for security. Once completed, I will sign the loved one’s first name or nick name, e.g. Dad, Mom, etc. on the back of the cremation keepsake in 22k gold, so as to be Forever in Glass. Necklace: Each cremation pendant comes with a 18″ Silver Snake Chain, as well as a black leather cord with an extension chain measuring 17 inches to 19 inches. Dimensions: 1.50” x 1.0” (Custom sizes are available upon request).